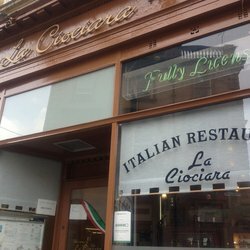 A pleasant and affordable family run Italian restaurant, La Ciociara is situated at the bottom of Friars Street - the first (and last) quality restaurant visitors will encounter as they make their way to (and from) the modern town centre to the historic sites of the Old Town and castle rock. Justly famed for their friendly manner, the staff can justly boast that they are as popular with locals as with visitors to the town. The Bruschetta and Gnocchi come highly recommended...but it's just as good for a late breakfast, a chat and a coffee. Those who wish to sample more 'traditional' Scottish fare should step next door - to the family's Il Viccolo chip shop. All tastes, as you can see, are catered for!